The Eagle Pro Box Lacrosse League was first formed on March 13, 1986, with designs on fielding teams in 1987. To say it was compact, and to say it was not a national league would be an understatement. In that first season, the league consisted of four teams -- New Jersey, Philadelphia, Washington and Baltimore. Yes, everyone made the playoffs, and Baltimore defeated Washington (who both were 2-4 and in third place in the regular season) by a score of 11-10 in the championship game. The title contest was watched by 7,019 in the Capital Centre in Landover, Maryland. The same four teams returned for 1988, with Washington winning after an eight-game regular season. 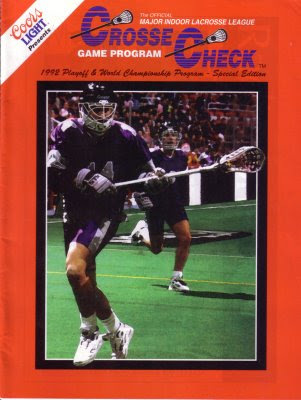 Detroit and New England joined the league (now called the Major Indoor Lacrosse League) in 1989, with Philadelphia edging New York (the former New Jersey) for the championship before more than 16,000 happy fans in the Spectrum. The Wings repeated in 1990. In 1991, the league split its six teams into two divisions and played a 10-game season. Detroit defeated Baltimore, 14-12, in the final. Meanwhile, in Buffalo, the ownership of the Buffalo Sabres had come to realize that it needed a new arena. Seymour and Northrop Knox, the major partners, had decided that Memorial Auditorium had come close to outliving its usefulness after 51 seasons, and the team was trying to justify the public expenditure needed to fund a new building. One of the tactics was to create new teams that would fill up dates in a brand-new facility. The Sabres had looked into an indoor soccer team in the summer of 1991, but the financing and other details didn't quite work out on relatively short notice. Lacrosse, however, was easier. Sabres fans had a slight association with box lacrosse, as Rick Dudley spent the summer of 1974 playing for Rochester Griffins of the National Lacrosse League. The original NLL went out of business in 1976. On October 1, 1991, the Bandits were created as an expansion team for the 1992 regular season. The team colors were black, orange and white. They were placed in the National Division with Detroit, Boston and Pittsburgh, while New York, Philadelphia and Baltimore were in the American Division. Buffalo had no say in its new nickname of the Bandits; it was assigned by the league. "The addition of sports like indoor lacrosse to Memorial Auditorium's schedule of events fits well with our plan of developing a variety of sports and entertainment offerings for Buffalo's new sports and entertainment complex," Seymour Knox said. While the Sabres didn't actually own the team -- the league had that distinction -- the hockey team had a financial stake in it and stood to share in the proceeds. On October 10, the team's management was announced: Johnny Mouradian was the general manager, Bob "Buff" McCready was the head coach, and Peter Crawford and Les Bartley were McCready's assistants. "The contact is unbelievable. ... I think the Buffalo people will love it," McCready said. A roster was assembled, consisting entirely of rookies to the league. "It may seem that we have an all-rookie roster, but we have come up with some of the better college players in the States that probably weren't exposed to the league because they were quite a ways away from it," McCready said. "And then we had the Canadian talent. A lot of the players didn't play down in the American league because it was too far for them to go. But now with Buffalo here it makes it a lot more attractive for them." The Canadian angle is actually the key to the Bandits' immediate success. A wealth of talent was just across the border, and Buffalo was thrilled for the chance to scoop it up. "Before we came into the league, from what I can recall, each team could have three Canadians," Mouradian said later. "As a border town, we had an opportunity to have 12. Listen, I'd love to take credit for being a genius but we had 12 Canadians. It was a good situation to be in. We went in having the mindset that we could win this thing." Two names jump out when reviewing the Bandits' first draft in 1991. Darris Kilgour of Nazareth College was the first-round pick, while Ross Cowie came from Brock University in the fifth round. The most important player did not come to the Bandits as a free agent, but rather in a trade. John Tavares was the property of the Detroit Turbos, but he was acquired by the Bandits for Brian Nikula. "I was drafted by the Detroit Turbos but I requested a trade to Buffalo for a couple of reasons," Tavares said. "I really didn't want to play for a powerhouse team. They (the Turbos) had won it last year and really looked strong. Plus, because of the travel circumstances, it was an easier commute to Buffalo [from Toronto] than it would have been to Detroit." "I knew from day one it was the best trade we could have made," said Bandits captain Jim Veltman. "He's such an exceptional player. I'd played against him in Canada and I can tell you he definitely was worth at least a Gait (Detroit all-stars Paul and Gary)." The Bandits took to the floor for the first time as a team on December 28 in Rochester for an exhibition game with Detroit. The Turbos had Gary and Paul Gait, twins who were stars at Syracuse University. The Bandits dropped a 24-14 decision. Opening Day was set for January 4, 1992. New York was the opponent, and the Saints beat the Bandits, 21-17, before 9,052 in Memorial Auditorium. The size of the crowd was the first shock. "I was more scared about playing at Memorial Auditorium and having no one show up," Rich Kilgour said. "We get there and the butterflies are going, and then they came in and told us we had to wait a half-hour because there were too many people waiting to come in and buy tickets. We were all surprised and happy about that, and then the next thing that dawned on us was that we had never played in front of a crowd that big before." Darris Kilgour had the first goal in team history, only 10 seconds into the game. The Bandits went 17 minutes without a goal at one time, and that proved fatal. "That happens in lacrosse," said Bandits coach Buff McCready. "There's some times you just can't buy a goal. It's not as though we don't have the shooters to do it. It's just that that will happen." The losses started to mount, as the Bandits dropped more games to New York and Detroit to be 0-3. The 23 goals given up in the loss to the Turbos stood as a team record through at least 2009. Now here's where it gets interesting. Mouradian decided to make something of a coaching move at that point, moving Bartley to something resembling head coach, while McCready was essentially demoted to goaltender coach. But they never announced it in public, although the public relations staff was urged to direct the media to talk to Bartley. However, Bob Summers of The Buffalo News covered the team for that first year, and he talked to McCready after home games and had no idea there was a switch. Well, someone threw a switch. The Bandits recorded their first victory ever on February 8, a 23-13 win at Pittsburgh. Veltman and Derek Keenan had five goals each in the game. "Our goal is to win our final five games," said Veltman. "It may sound impossible, but we know we have the confidence to win games because we played some of the league's best teams (New York and Detroit twice) close in our defeats." Buffalo came home before a sellout crowd and thumped Philadelphia, 20-11. It was only the second sellout in the history of the league. Kilgour had four goals, while Tavares and Kevin Alexander had three each. The only catch to the night was that Rich Kilgour, Darris' brother, suffered a serious knee injury that ended his season on a collision with two Wings players. "I've never felt anything like that before," Kilgour said. "It actually felt like the knee was on fire for about 30 seconds." The Bandits continued their run with wins over Detroit (22-9, no less), Baltimore (another home sellout) and Boston. The run gave the Bandits a 5-3 regular season record. The Baltimore game on March 13 featured a 27-20 score that set league records for goals by one team and by two teams, while Keenan had four goals and 10 assists. Buffalo scored 12 goals in a single quarter. "We were just lost at the beginning of the season last year," Keenan said. "After we adjusted, we were fine." Rich Kilgour credits Bartley for some of the turnaround. "(Les) was really good at being organized," he said. "He had a lot of balance but at the same time he made sure everyone knew their role and just tried to keep everybody honest. ... We had some really, really good players and good leaders at the time." The Bandits' popularity probably played a roll in a quick change to the MILL's playoff structure, which came along the way. Instead of a simple one-game championship between the division winners, the league went to a three-round playoff system that figured to put a playoff game in Buffalo. Tavares remembers looking around at the building some nights and thinking that the scalpers were making more money off the game than he was. Tavares was paid $125 per game at that point. For the season, Keenan led the team with 26 goals and 23 assists in eight games. He was named the league's rookie of the year for his accomplishments. Tavares wasn't far behind with 43 points, while Darris Kilgour had 39 points. Veltman led the team in loose balls with 111, Cowie and Bill Gerrie divided the goaltending, and Gerrie had a 4-0 record. Keenan, Kilgour and Veltman were second-team league all-stars. Buffalo earned second place in the division, and hosted the Boston Blazers in a first-round playoff game on March 27. The Bandits won that game, 22-16, before 15,603. Tavares had six goals. "I was just in the right spot at the right time," he said. Then it was on to Detroit, where Buffalo took a 19-16 contest from the defending champion Turbos on April 4 in a game broadcast on the Empire Sports Network. Bob Hamley had four goals, while Bill Gerrie made 44 saves. The win set up the championship game on April 11 in Philadelphia, as the Wings had defeated the Saints, 8-6, in the other semifinal. In a close, tense contest that again was shown on Empire, Buffalo trailed by a goal in the fourth quarter. "We were down and Derek Keenan wanted the ball," Mouradian said later. "He just said, 'Give me the ball.' And he took this shot to tie it up that was just amazing. It was a long shot and he buried it." Tavares finished the game with four goals and one assist to earn MVP honors. He finished the playoffs with 12 goals and 12 assists in the three games. "I've never seen a one-man show like that before," said Gerrie, who was 3-0 in the playoffs to finish an undefeated 1992. No team had ever won the championship in its first season, with the exception of course of the first year of the league. What's more, the building was constantly packed. "We don't use that word [profit], but our plan was exceeded financially. ... We were very, very pleased," Knox said. You couldn't ask for a better start for a sports franchise.